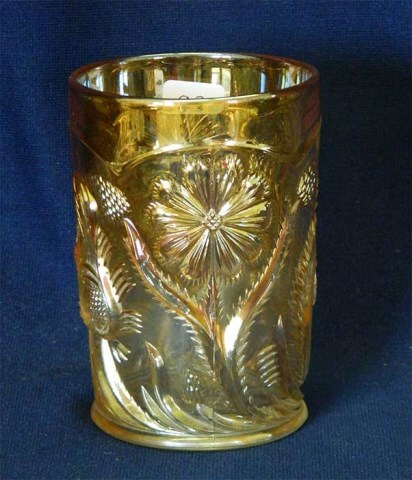 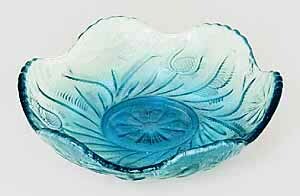 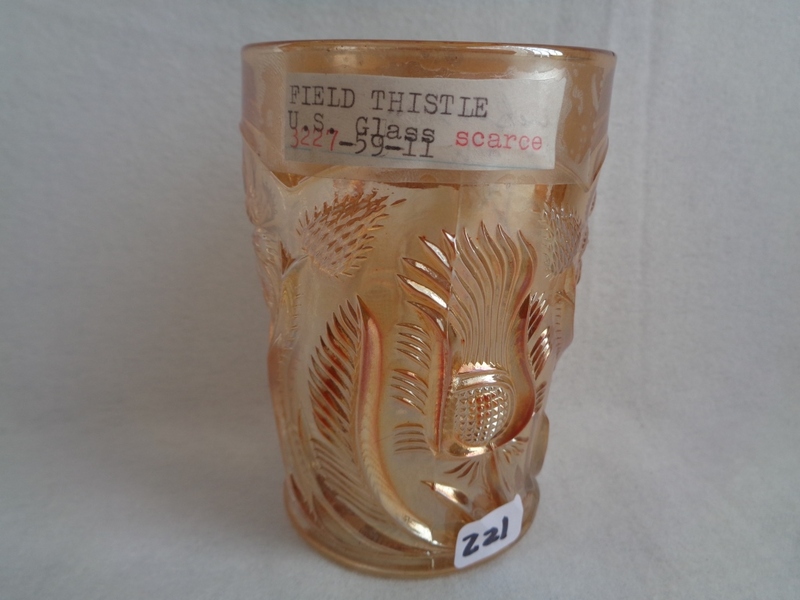 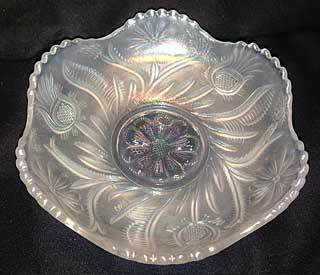 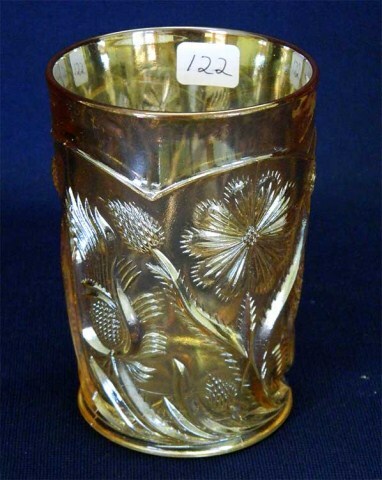 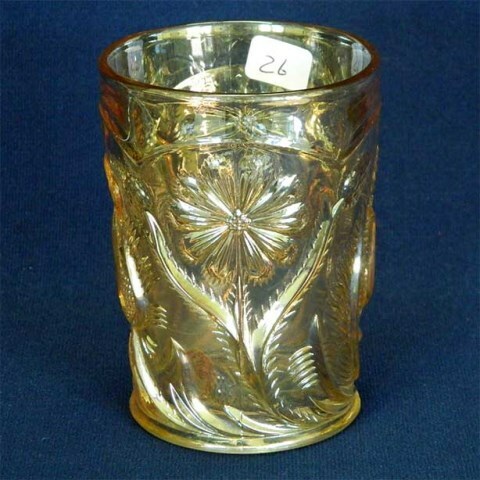 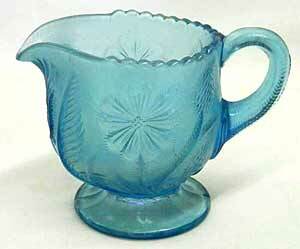 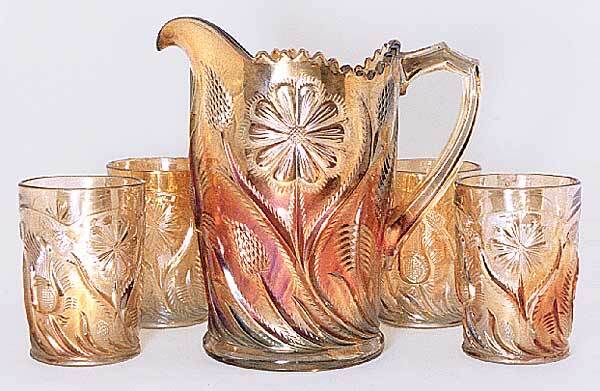 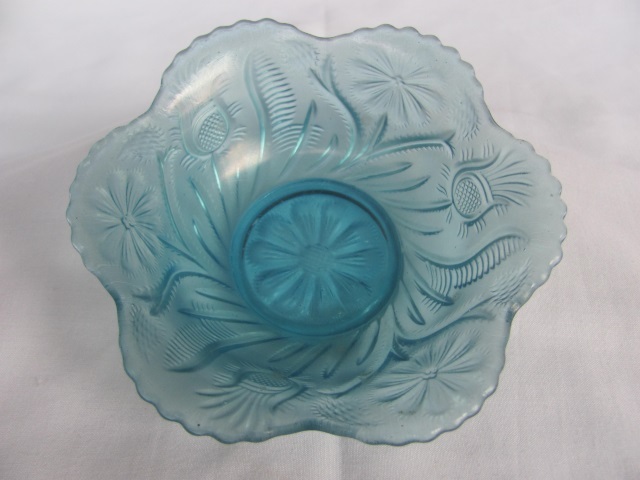 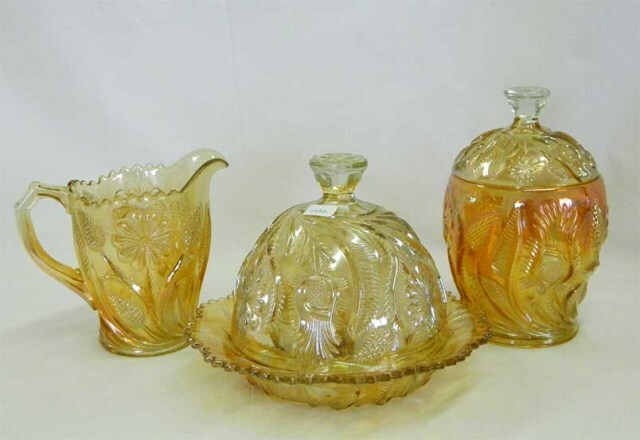 Although made in crystal in a wide range of shapes, iridized pieces of Field Thistle are quite scarce. 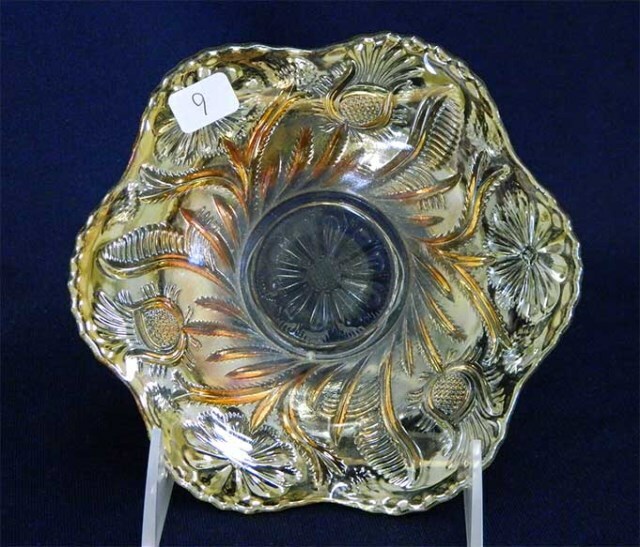 The design is characterized by a largish flower with stems and thistles swirling up from the base to either side of the flower. 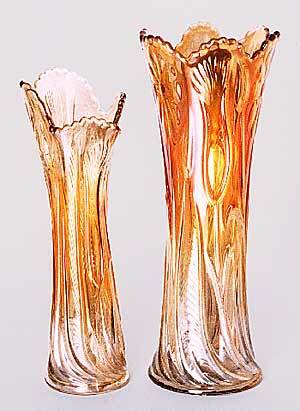 Compotes are fairly large and massive–about 7 inches tall. 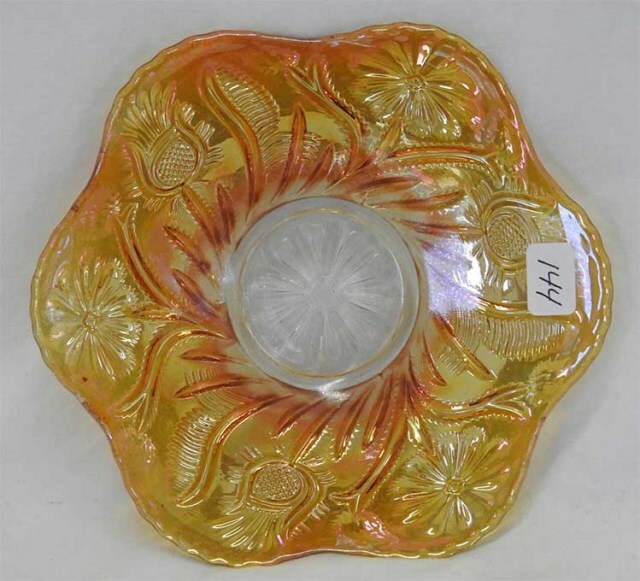 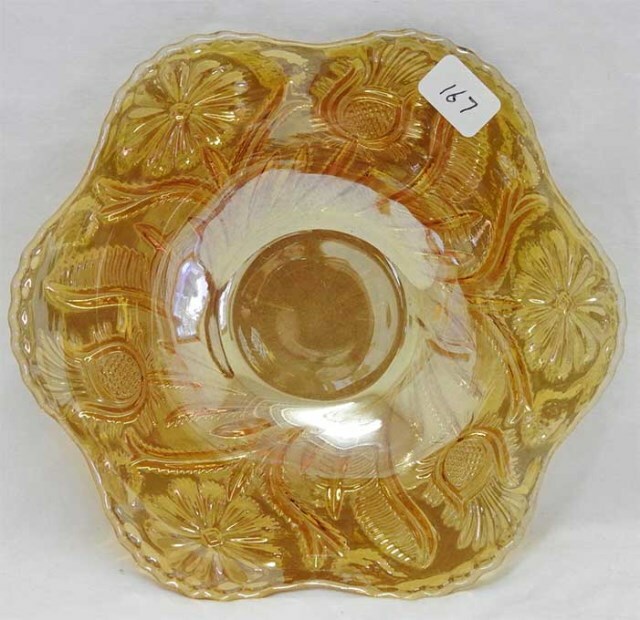 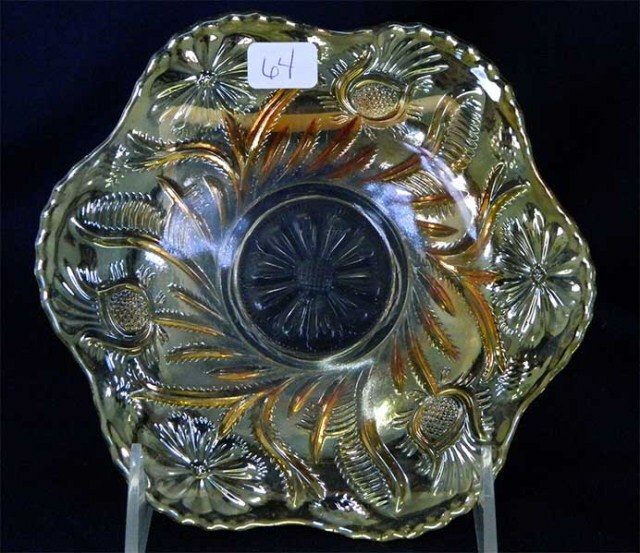 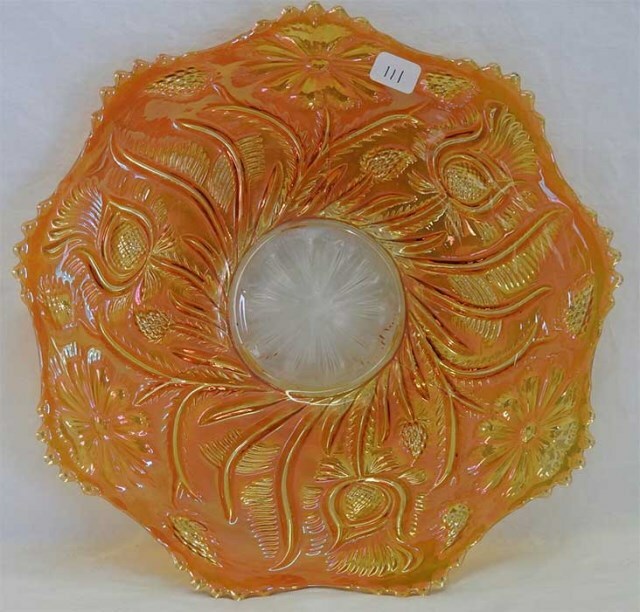 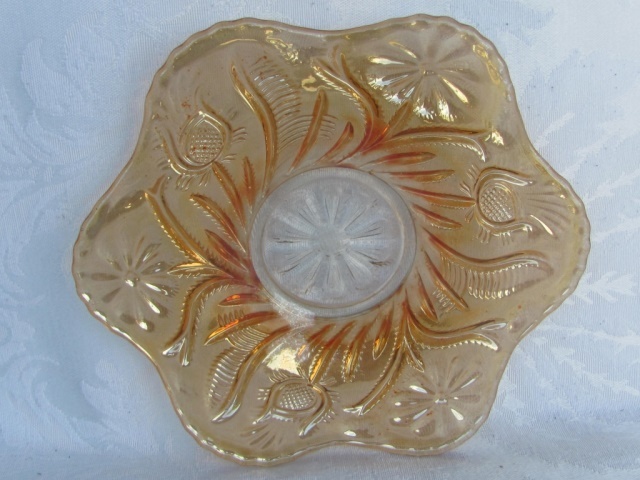 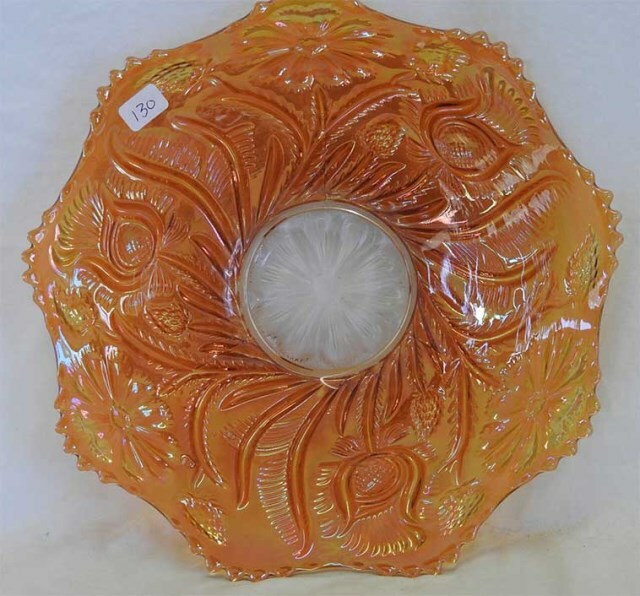 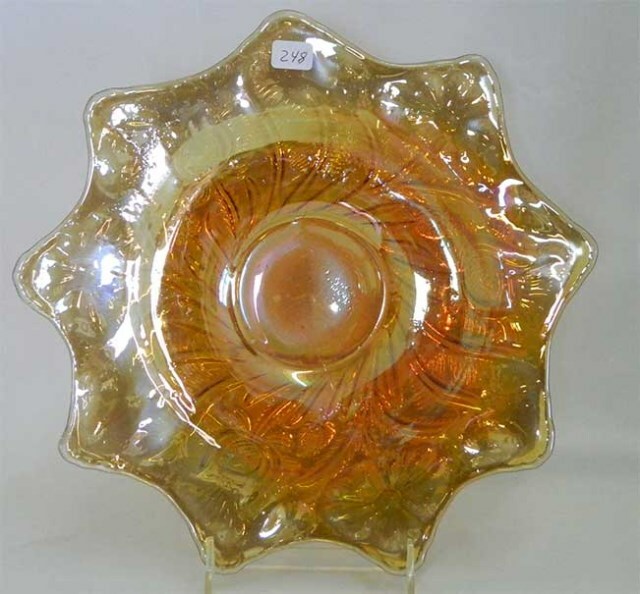 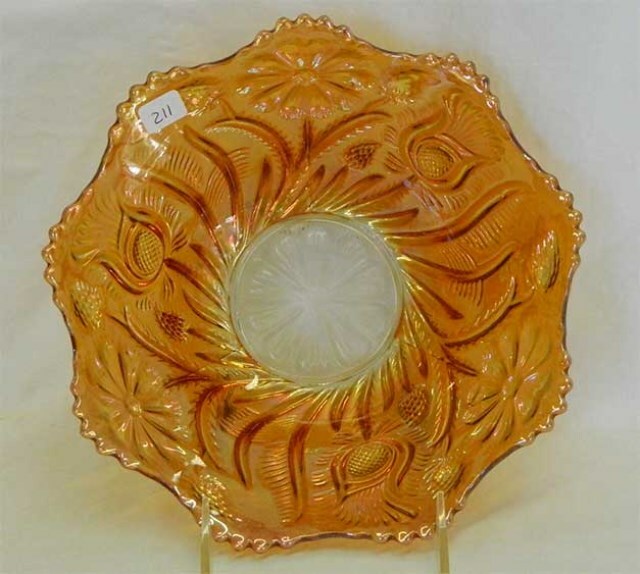 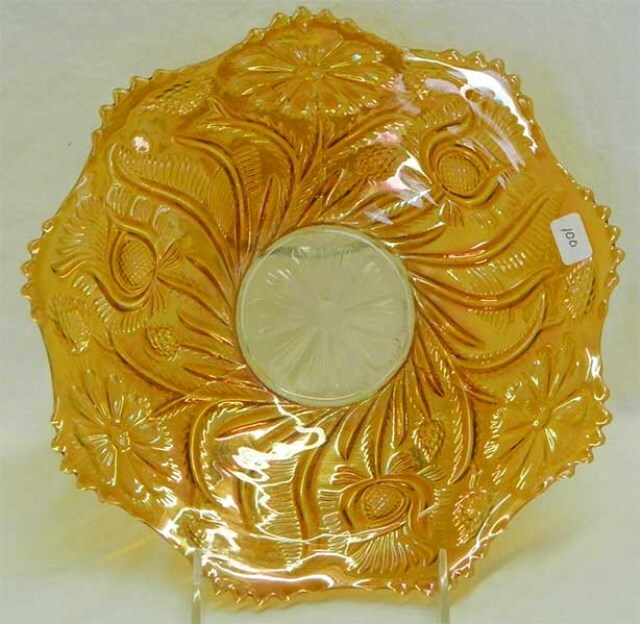 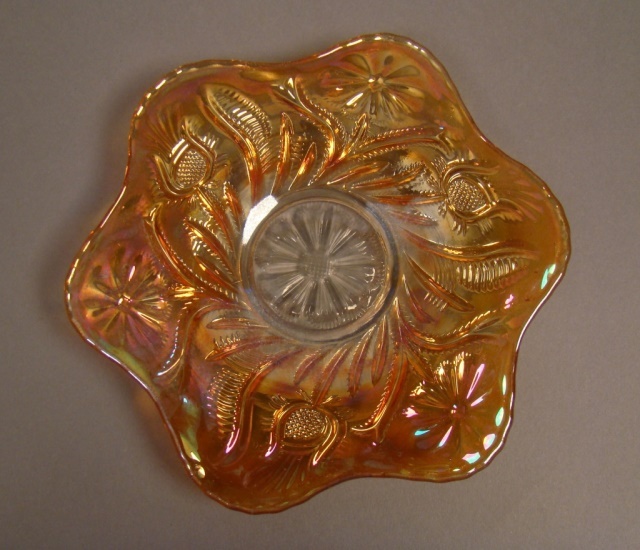 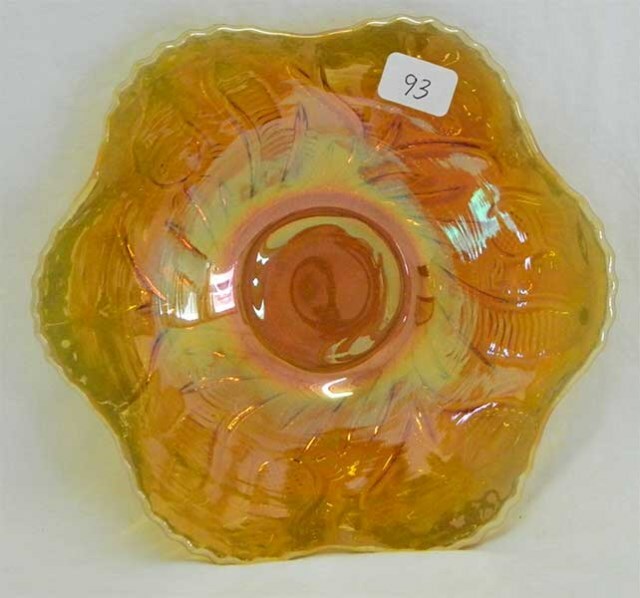 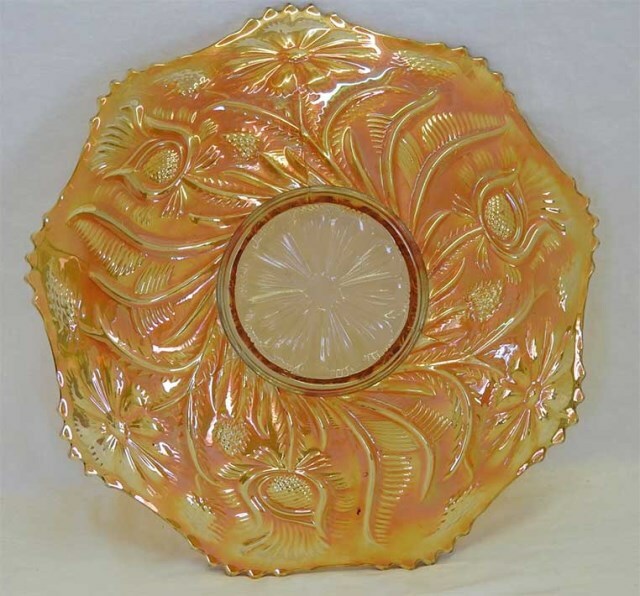 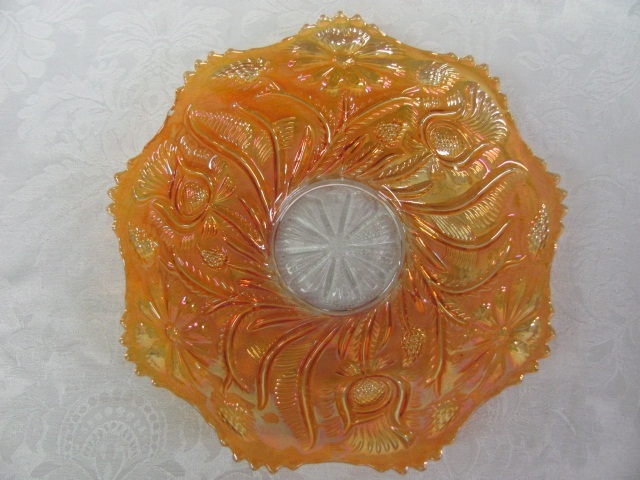 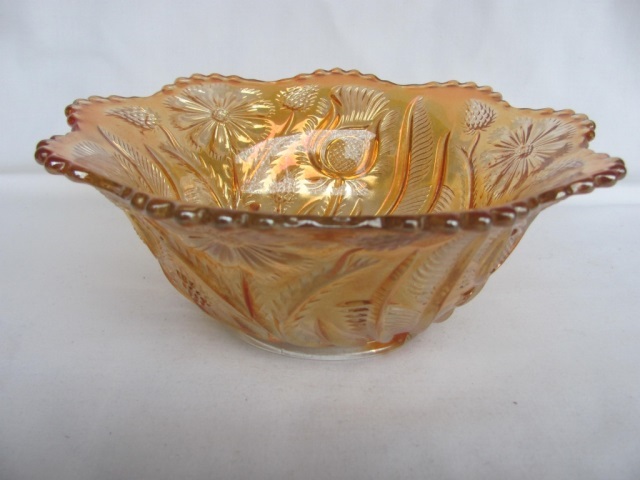 Above is a 9-inch plate in marigold. 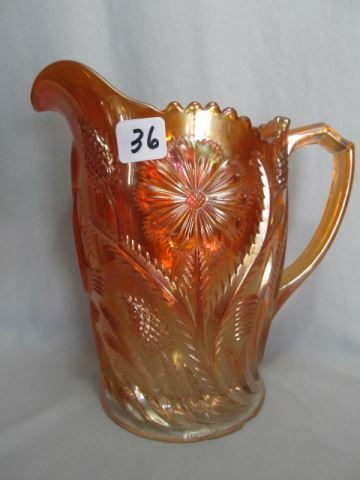 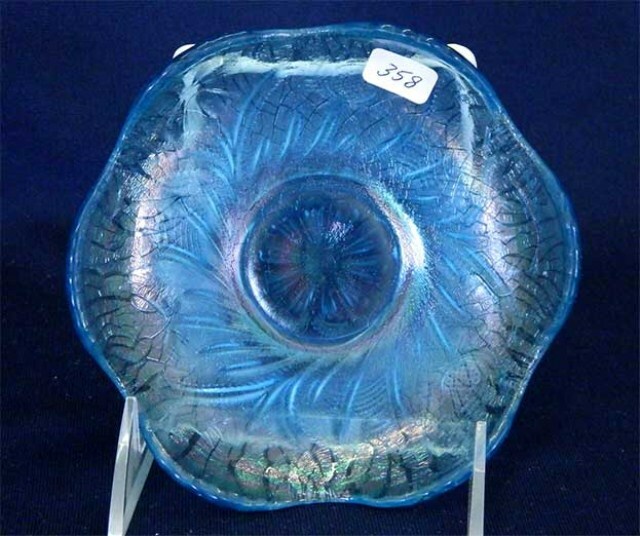 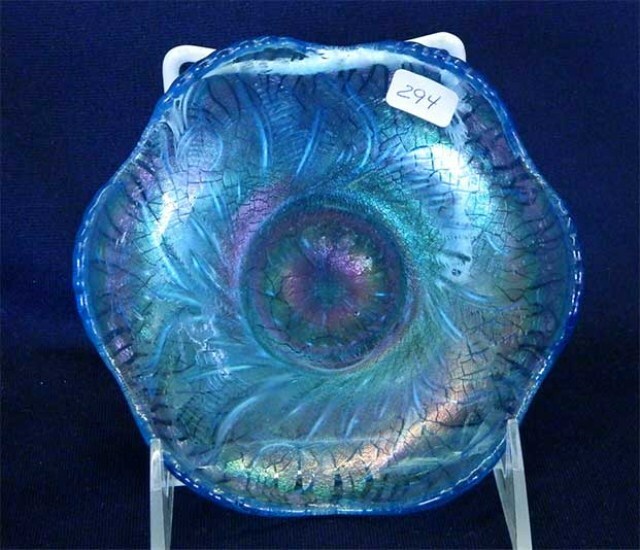 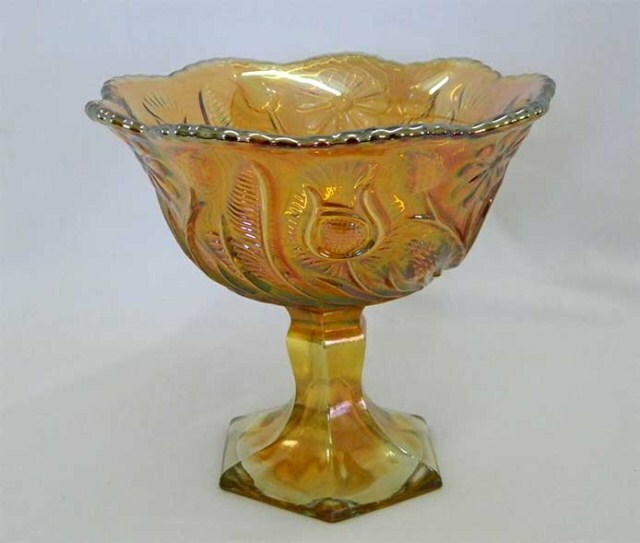 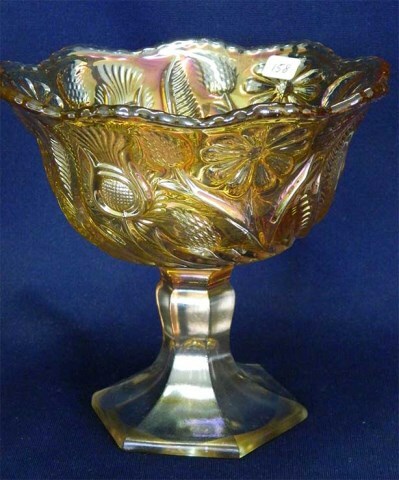 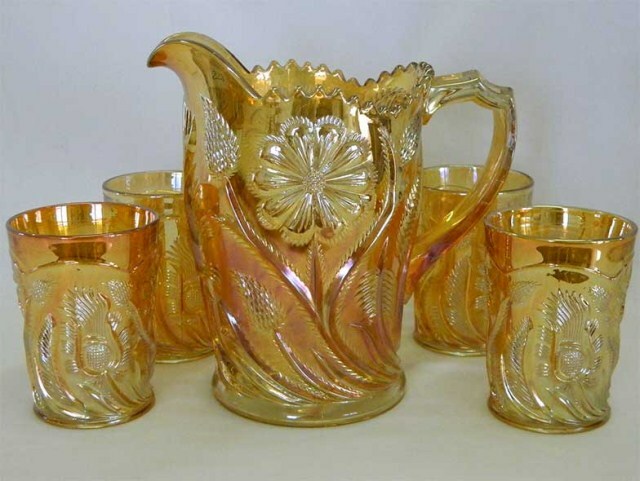 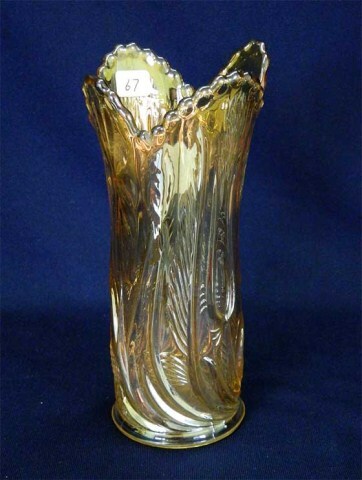 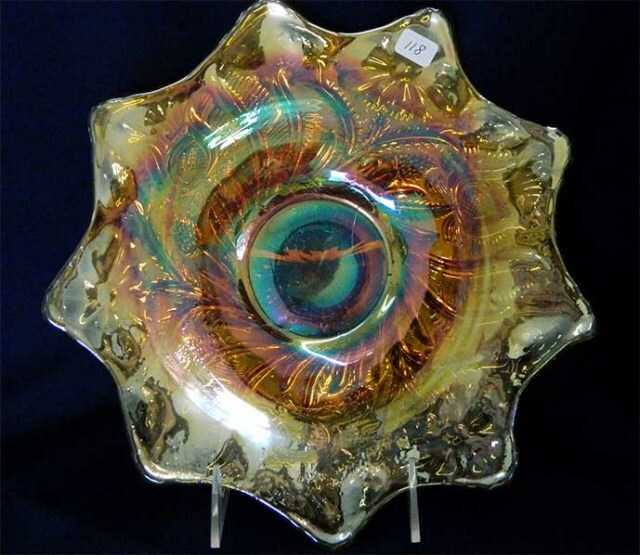 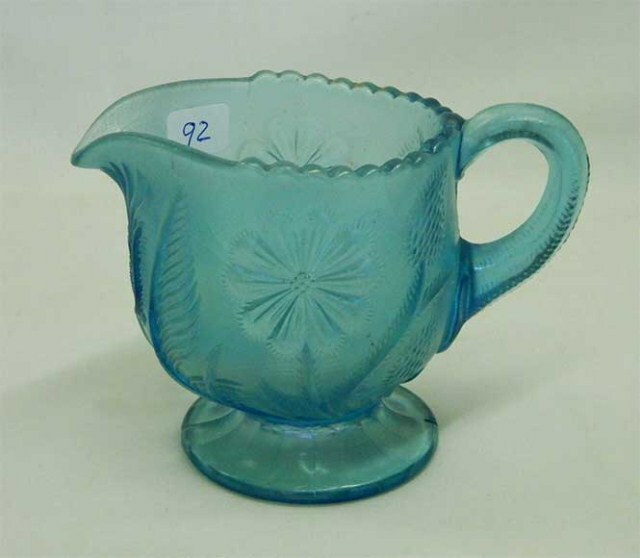 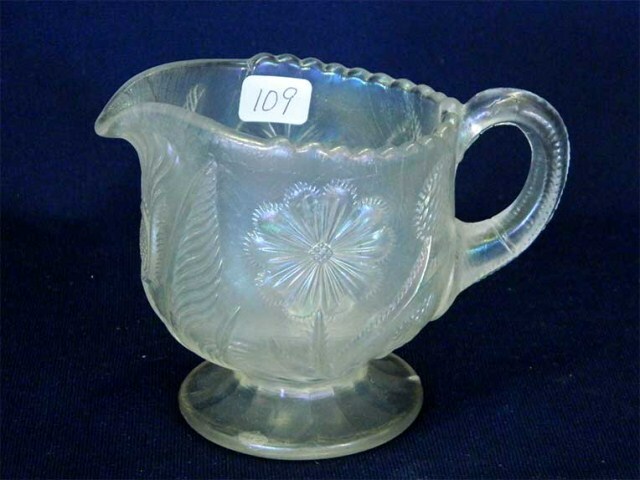 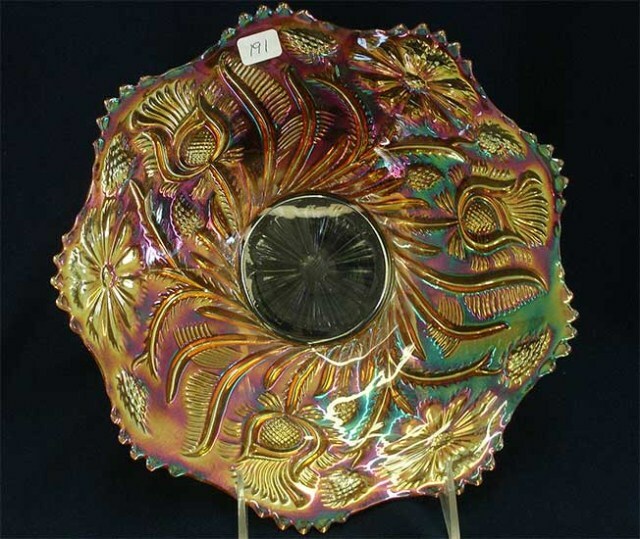 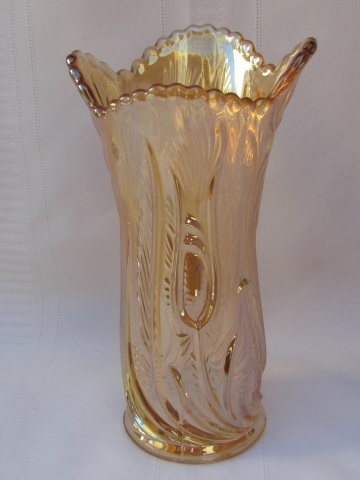 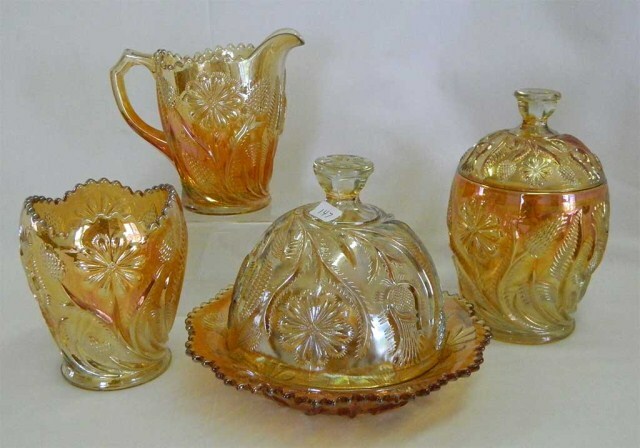 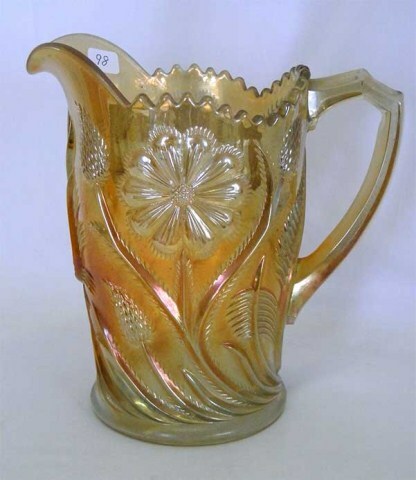 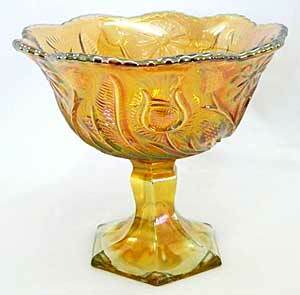 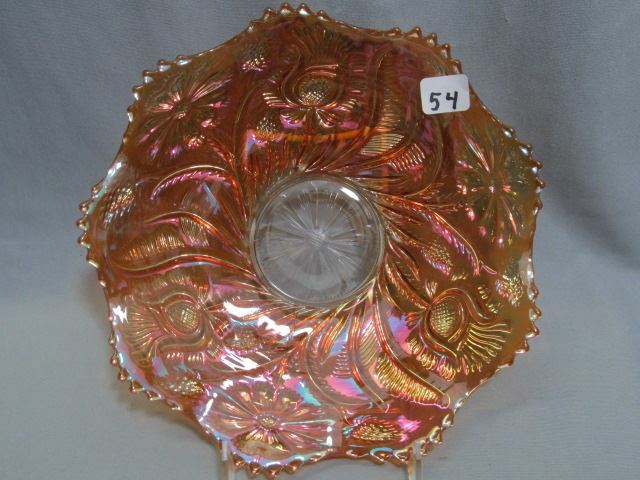 It has great iridescence and brought $425 at a 1996 auction–quite a bit more than at recent sales. 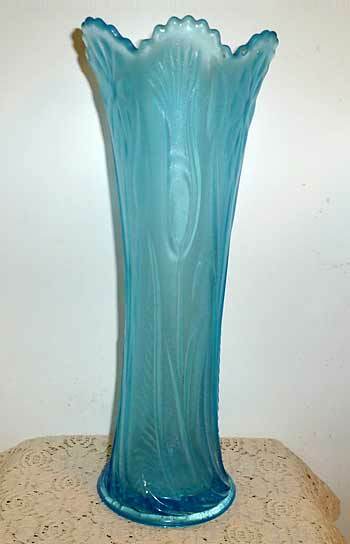 In November of 2013, Greg Dilian sent me this photo (above left) of his Field Thistle vase in celeste blue. 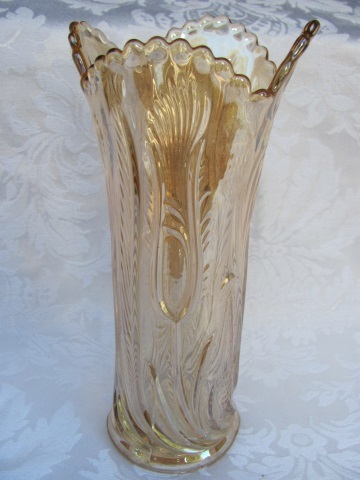 It is 12 inches tall and has a 3 3/4 inch base. 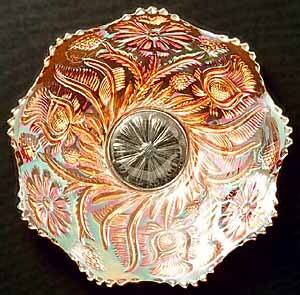 Amazing. 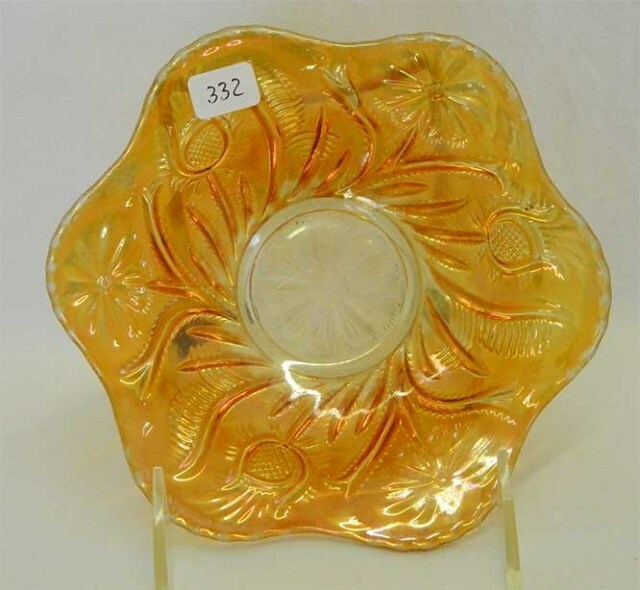 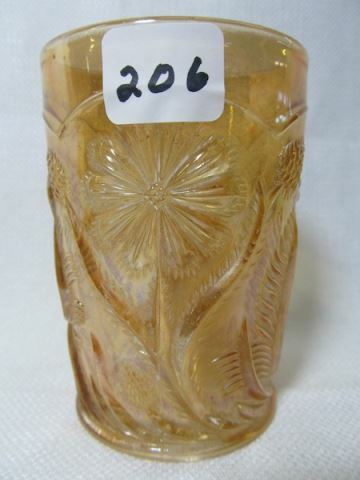 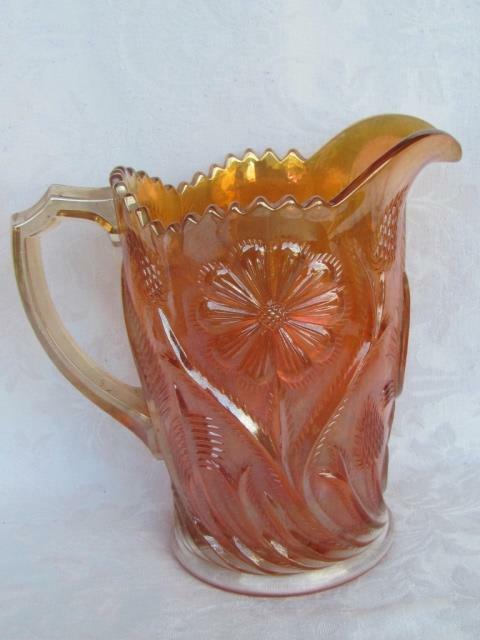 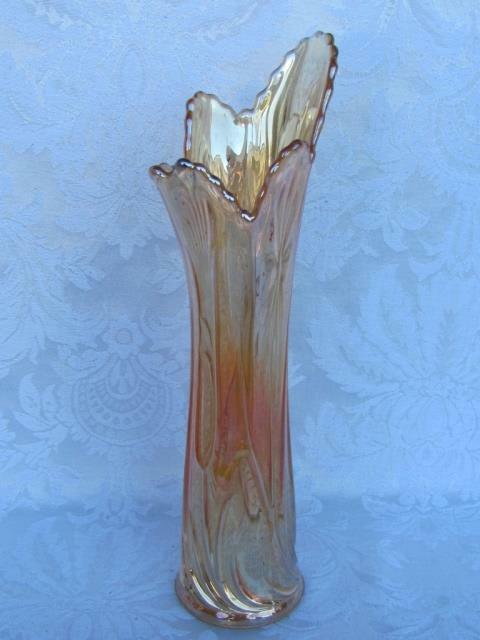 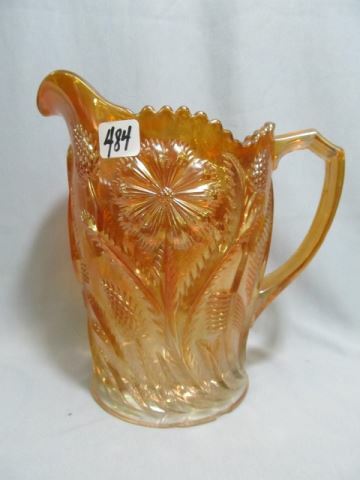 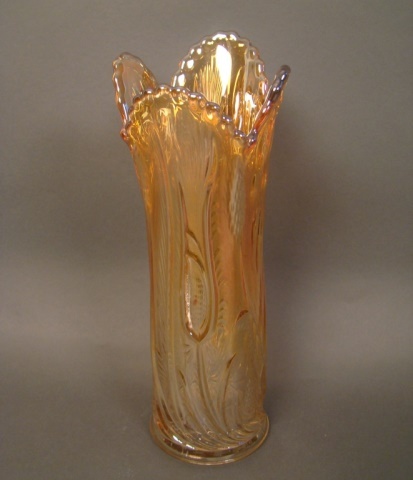 I've never heard of a Field Thistle vase in anything but marigold. 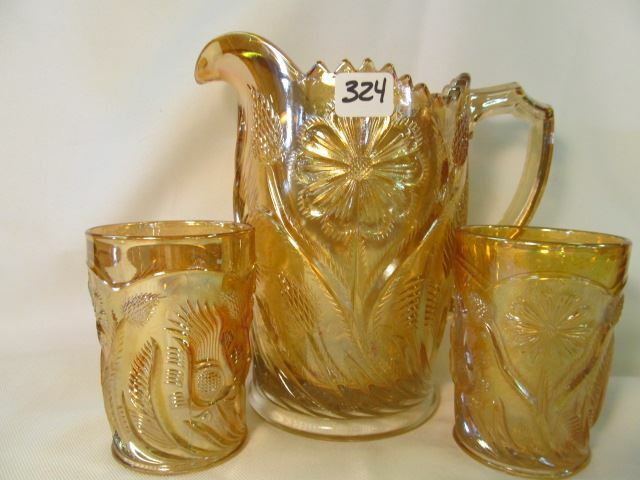 On the right are the rare vase whimsies that are found in two base sizes: 2 3/4 inches (and pulled up from the spooner), and 3 3/4 inches. 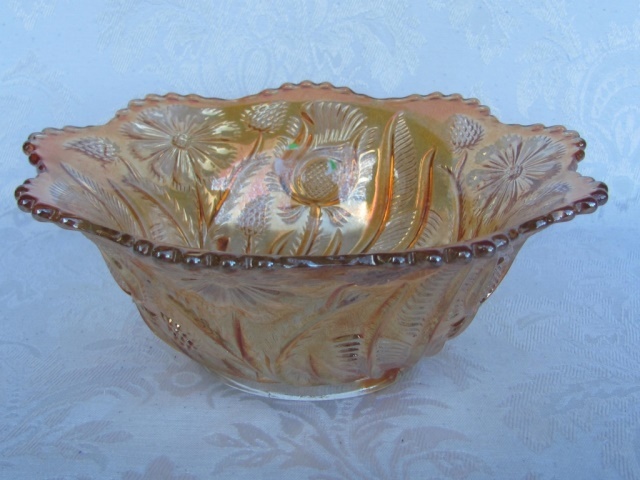 The small bowl on the left is in celeste and brought $475 in 1998. 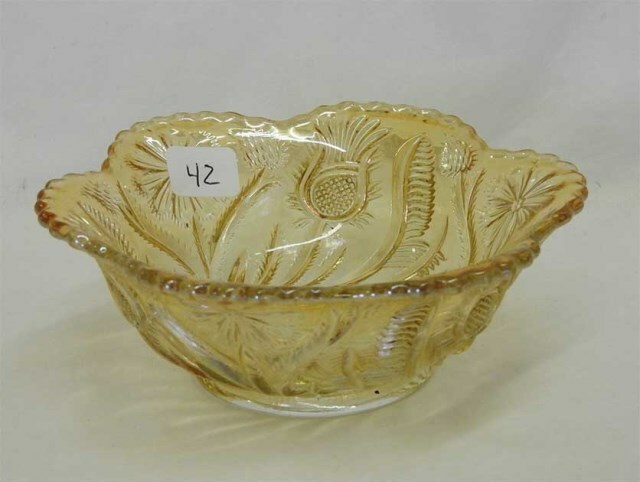 The photo on the right is of a small bowl in white that was sent to me by Gregory Ferguson in 2013. 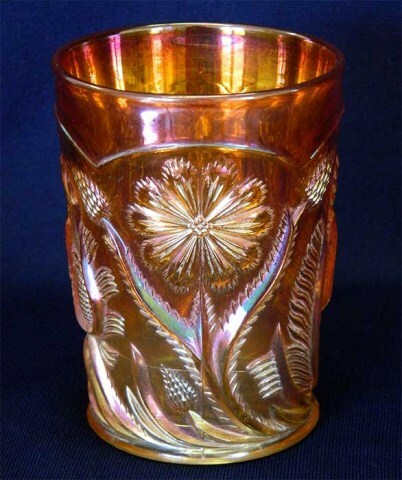 The color is previously unknown in the pattern.